1.❤ Inspiration❤: This women bracelet features is the asymmetric knot shape, and meaning that the fateful person will span time and space to meet, and feeling the power of fate. 2.❤Material❤:Genuine crystals from SWAROVSKI and 14k copper plating gold, about 7\" inner circumference,suitable for most girls&women. 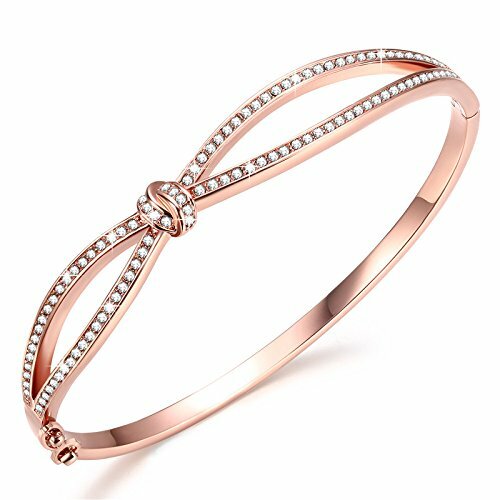 3.❤Gift Idea❤:Our infinity bracelets are packed in an exquisite custom gift box.An ideal gift for wife,girl,girlfriend,daughter,mum or yourself on Mother\'Day,Valentine\'Day,Birthday, Anniversary,Celebration,Wedding,Engagement,Congratulation,Party. 5.❤Customer First Service ❤️: 100% satisfaction and money back guarantee.If there are any problems with the purchase, please feel free to contact us, we will help to fix the problem in first time or make the full refund.